An ecosystem in freefall, a shrinking water supply for cities and agriculture, an antiquated network of failure-prone levees—this is the Sacramento-San Joaquin Delta, the major hub of California's water system. 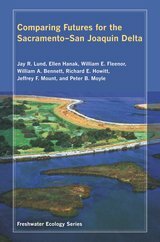 Written by a team of independent water experts, this analysis of the latest data evaluates proposed solutions to the Delta's myriad problems. Through in-depth economic and ecological analysis, the authors find that the current policy of channeling water exports through the Delta is not sustainable for any interest. Employing a peripheral canal-conveying water around the Delta instead of through it—as part of a larger habitat and water management plan appears to be the best strategy to maintain both a high-quality water supply and at the same time improve conditions for native fish and wildlife. This important assessment includes integrated analysis of long term ecosystem and water management options and demonstrates how issues such as climate change and sustainability will shape the future. Jay R. Lund is Professor of Environmental Engineering and Director of the Center for Watershed Sciences. William E. Fleenor is a Research Engineer in the Environmental Dynamics Laboratory. William A. Bennett is a Research Scientist with the John Muir Institute of the Environment. Richard E. Howitt is Professor and Chair of Agricultural and Resource Economics. Jeffrey F. Mount is Professor of Applied Geosciences. Peter B. Moyle is Professor in the Department of Wildlife, Fish, and Conservation Biology. They are all affiliated with the Center for Watershed Sciences, University of California, Davis. Ellen Hanak is Director of Research and Thomas C. Sutton is Chair in Policy Research at the Public Policy Institute of California.